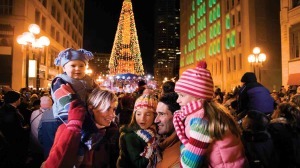 What is not to love about the Holiday season in Indianapolis? We’re lucky enough to smack in the middle of downtown so we’re able to see all off the beauty that Indy offers in December. Here is our list of the best Holiday events in Indianapolis. 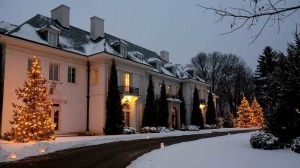 Christmas at the Lilly House on the grounds of the Indianapolis Museum of Art uses the American country house setting to explore the decorative ideas of the 1930s and 1940s. Explore this piece of history and witness nearly a century of holiday tradition firsthand. Jingle Rails at the Eiteljorg Museum of American Indians and Western Art is a journey to the Great American West – the real West and the West of the imagination. With over 1,200 feet of railroad, watch seven trains wind past the local treasures of downtown Indianapolis, including the Eiteljorg Museum, Monument Circle, Union Station, and Lucas Oil Stadium, as well as historical sites, including Mt. Rushmore, the Grand Canyon, Yosemite Falls, and Old Faithful. 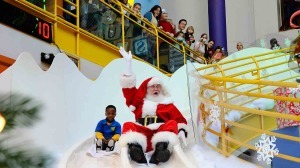 Jolly Days Winter Wonderland is a holiday treat for the whole family at The Children’s Museum of Indianapolis. 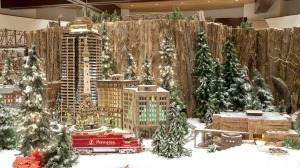 Complete with an indoor “ice skating” rink for children to skate in their socks, an ice fishing area, and a holiday train, this is an unbeatable family tradition. Mark you calendar – on November 29, Santa will arrive Indy style in a Dallara IndyCar! Circle of Lights is the world’s largest Christmas tree, complete with nearly 5,000 lights and 52 garland strands streaming from Indy’s beloved 242-foot tall Soldiers and Sailors Monument. This tree has been named by Travelocity as one of the top five must-see Christmas trees in the nation. Celebration Crossing at the Indiana State Museum invites you to learn about holiday traditions, both longstanding and new. 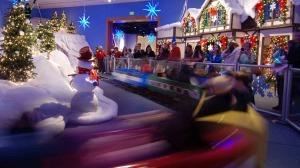 Visitors can ride the Santa Claus Express, visit with Santa and get their photo taken, and participate in holiday- and winter-themed activities on all levels of the museum. 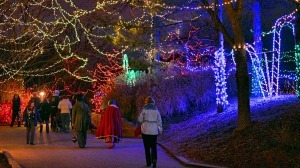 Christmas at the Zoo is a wintertime extravaganza everyone will enjoy. Stop by the Indianapolis Zoo for its annual light spectacular, and experience one of the nation’s top 10 zoos in a whole new way as hundreds of thousands of sparkling lights delight and inspire. Soaring 150 feet above the Skjodt International Orangutan Center, you’ll be able to spot the Beacon of Hope glowing in holiday colors from miles away. What are some of your favorite things in Indy around the holidays? * Event information and images courtesy of Visit Indy.